With plenty of hotels and beach resorts along the Fort Lauderdale coastline to choose from, there are also plenty of transfer options available to passengers who need to get to from FLL airport. Travelers can choose to book shuttles, chauffeured transportation, ridesharing services and taxi rides, all at reasonable costs. As the closest large metropolitan area to Miami, you can find authentic cuban food which is a unique experience that is unique to south Florida. Ft Lauderdale has a distinctive Latin style throughout the city. You can always find transportation throughout the city with ridesharing services and taxicab rides just about anywhere. Fort Lauderdale is synonymous with sand, sun, and fun. The beaches here are beautiful and the weather is great year-round. Get your ride to and from the airport squared away before you leave for your trip to the Sunshine State. When arriving in Fort Lauderdale it makes things much smoother when your ride is already waiting for you. Go Airport Shuttle & Executive Car Service offers reliable service and has a fleet that includes shared ride shuttles, private vans, SUVs, and sedans. SuperShuttle Fort Lauderdale can offer you shared ride van service or you can reserve a van for your party. The Blue Van will get you to your destination quickly and at a very reasonable cost. Getting rides to popular resorts such as Hilton Fort Lauderdale Beach Resort can be made with local shuttle providers such as GO Airport Shuttle & Executive Car Service and SuperShuttle which has premium executive shared ride vans for up to 9 passengers per vehicle. All inclusive sedans can be taken with ExecuCar and by business class black car service with Blacklane. FLL Airport, present on the southern side of the city, serves residents of both Fort Lauderdale and Hollywood. The airport is of international significance, therefore, flights from all over the world land here, bringing people to enjoy the best time of their lives. The facility has an amazing staff which hosts the incoming tourists very warmly. Free Wi-Fi and cell phone charging booths help you remain you connected. There is a flight observatory area from where you can watch planes’ landings and takeoffs. Florida is arguably the most beautiful state in the United States. 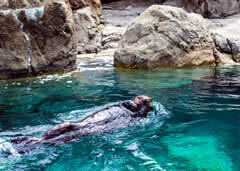 The state is surrounded by waters of the great Atlantic Ocean from three sides offering countless recreational options. Here you will find white beaches extending beyond your vision and clear blue waters where you can enjoy almost all sorts of water sports. Either it is scuba diving, snorkeling, kayak paddling, surfing, fishing, fishing, or enjoying yacht and cruise rides; you just name it and you will get to enjoy it here in Florida. In Florida, there are many beautiful cities when it comes to fun and adventure. One of the many one is Fort Lauderdale, present on the eastern ridge just above the famous city of Miami. Inside the city, there are boating canals where you can hire a yacht and watch the luxury lifestyle of the city. In this city, you will also come across resorts, hotels, bars, restaurants, shopping malls, and boutiques. You can get everything you wish for. Fort Lauderdale-Hollywood International Airport can be a pretty confusing place when you first step into the facility, but don’t let the crowds get you frazzled. Instead, think ahead of time and make sure you hop aboard one of many providers such as Go Airport Shuttle & Executive Car Service who has many shared ride vans, which are available just outside baggage claim. Have your bags handled and get transported to your nearby hotel, whether it’s a 5-star resort or a quaint little inn. Be sure to ask us ahead of time if there are any existing offers that could result in even more savings. If saving time is more important to you than saving a buck, reserve a private van from us and take a fun ride to Bonnet House, a historic plantation home with lush gardens and a background worth learning about. If you’d like to see other historic parts of the city, visit the Stranahan House, a 1901 trading post that has been at the epicenter of decades of sharing international goods. The great thing about Fort Lauderdale is that it’s big enough to get lost in, yet small enough to ignore altogether. To get in touch with some of Florida’s beautiful wildlife, rent an intimate private sedan from local providers and drive to the Hugh Taylor Birch State Park, which is one of the only state parks in the country that offer real tropical forests with a diverse ecosystem of indigenous plants, animals, and aquatic life that seem exotic to the rest of the country. Groups that want to explore the city’s nightlife should get a private SUV for their exploits. Fort Lauderdale is not only home to an unearthly ecosystem, but a variety of entertainment as well, from veteran local flea market, Fort Lauderdale Swap Shop, to the famous venue that offers dance, music, and more, Parker Playhouse. For even higher stakes, visit Seminole Hard Rock Hotel and Casino, one of the biggest casinos in the state that offer national-sized jackpots. Arrive to Fort Lauderdale’s upscale Ritz-Carlton in absolute style by reserving a stretched limousine from some of the city’s classiest name in transportation. When you get to the hotel, be sure to go to the incredible restaurant, which is host to an amazing wine collection and dishes designed by the renowned head chef. If you’re in the mood for an even more exclusivity, make reservations for Market 17, a nearly perfect restaurant with sophisticated farm-to-table dining. The sheer size of Fort Lauderdale doesn’t come from the amount of people that visit, but the amount of space the city takes up. Visit expansive locations like South Beach, which is home to beautiful art deco shops, public beaches, and a variety of nightclubs, each one perfect for a group outing made by a chartered bus. You can get your very own by booking a reservation with us and find companies that offer top-of-the-line group transportation. If you are planning to visit any of the beaches in Ft. Lauderdale, the following local beaches make great day excursions for you and your family or friends. Here is some pertinent information about the main attractions at each beach to help you decide which beach is the best for you to visit while you are in town. → This is a very family friendly beach with a unique water skiing experience that allows you to be pulled over the water without the use of a boat. This makes it easier to learn while having fun if you are a beginner. → If you visit the Hillsboro Beach website you can get a live view of the Hillsboro Inlet where you can catch a glimpse of the boats and yachts coming and leaving the area throughout the day. Hillsboro beach is a quiet community with lots of ocean sightseeing including a vast amount animal life including sea turtles that make their way to the coastline regularly. → Known for its fishing, Pompano Beach is a great quaint little beach to visit. The city is also known for its popular Pompano Seafood Festival and Fishing Rodeo that occurs each spring. This beach town is an experience that is fun for the entire family. → If you are looking for excitement, the Seminole Hard Rock Hotel & Casino in Hollywood, FL is located near Hollywood Beach. This area is known for its dog friendly beaches and outdoor life. If you want to slow down take a stroll along the beach or a relaxing bike ride throughout the area. 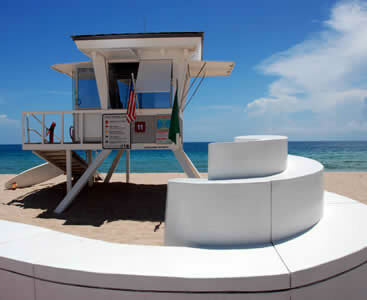 → One of the most popular beaches in the Greater Fort Lauderdale area, at Fort Lauderdale Beach you can find it all. The beach is also located near Las Olas Boulevard home to some of the area’s best shopping, places to eat and beach activities. → At Dania Beach you’ll find a more secluded area where you can find a quieter place to relax or fish off of its long fishing pier so you don’t need a boat to get into the deeper water. Located near John U. Lloyd Beach State Park where you can find kayaking, areas to have a picnic with the family or boating with friends. → Hallandale Beach is a great stop on your next trip. With easy access to the Florida Derby and a few gaming centers this beach community has plenty of activities which include fishing, boating and a casual day of golfing out with friends. → Just east of Ft. Lauderdale, this beach community is a true tourist attraction for beach goers who like to snorkel or go diving along the coastline reefs. If you are looking for a place to relax and see beautiful scenery, Lauderdale-By-The-Sea is the place for you. One place you will not want to miss on your tropical vacation in Ft Lauderdale is the famous Las Olas Boulevard. With a multitude of places to eat and unique art galleries and museums that you can visit, Las Olas Boulevard offers a one of a kind shopping experience that you can see only in South Florida. If you are looking for a one-of-a-kind educational experience this is a world-class museum worth visiting. With its own IMAX theater, the Museum of Discovery and Science has plenty for the entire family to do. Discover animals that are native to Florida up close and personal. There are also displays for those who want to learn about space travel and advances in aviation. Located in Broward County the Fort Lauderdale-Hollywood International Airport has easy routes located near downtown Ft. Lauderdale and also Port Everglades which has cruise ship terminals nearby for those headed out for a cruise. Getting a ride to and from FLL airport is easy with great providers such as GO Airport Shuttle & Executive Car Service and Blue Van service from SuperShuttle which both offer shared ride vans and private shuttle van transfers. Travel to the many hotels on the beach such as the Pelican Grand Beach Resort which is A Noble House Resort where visitors stay for the night can experience a unique style breakfast on the beach. Find shuttle rides to the Lago Mar Resort and Club where you have a great location to watch the passing cruise ships go by. There are many fine places you can eat in Fort Lauderdale like the Dolce Salato Pizzeria & Gelato where you can experience authentic Italian food or at Laspada’s Hoagies where you can find some great sub sandwiches. 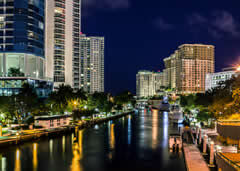 While there are many things you can do while you are in Ft. Lauderdale there are some that you may want to visit before you leave such as Las Olas Boulevard for those looking for a unique shopping experience. There are several transfer options for passengers needing to get to The Broward Center for the Performing Arts which is a great way to spend the day where you can enjoy shows from performers, ballets and the best comedians.